It's that time of year again where we're constantly wiping our door knobs with lysol wipes, making sure our kids are constantly washing their hands and for me, making sure that I have the essentials I need so if my kiddos get sick, I'm prepared and ready to go. 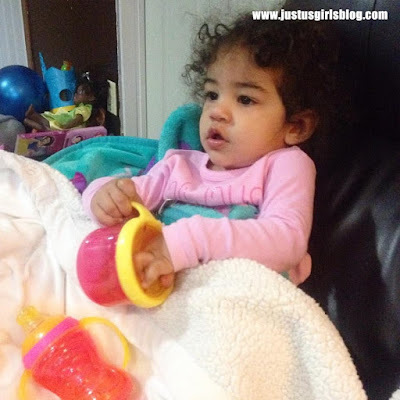 A few weeks ago my youngest got sick. She had a stuffy nose and wasn't feeling too good. I'm so glad that I had Boogie Wipes handy. Although she can't blow her nose herself, the Boogie Wipes are pretty amazing. They're made with Natural Saline that help dissolve mucus that's caused by the common cold. They're also hypoallergenic so they can be used by all kids, adults too! I really like that they're not hard on your nose like tissue can be and they keep your nose from being sore and tender. They also contain Vitamin E, Aloe and have Chamomile on them to help moisturize the skin. Boogie Wipes are great to have in the home this time of year and come in handy when you're traveling as well with their travel pack. It's small enough to fit in your diaper bag or purse and come in Fresh Scent, Grape and Unscented and come in a pack of 30 count or in a 90 count canister. They're definitely a must have for anyone with little ones, this time of year. I like sending my older kids to school with their 30 pack count wipes so that they always have them handy in case they or a friend needs a wipe. 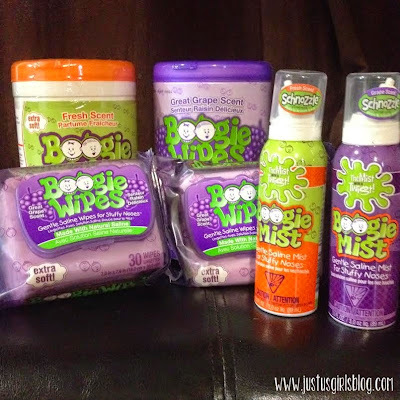 For more information about both Boogie Wipes and other products and where you can purchase them, you can head on over to www.boogiewipes.com.